How to starting private char. Please send your Order ID to us support email, we will tell you how to connect us by Whatsapp or Skype! How to get git access. Please send your Order ID to us support email, we will create git access for you on Bitbucket! Please consider giving a 5 stars rating, is very important to us! - Added right side messages panel. - Updated source code structure (More clear structure). - Fixed page footer show state. - Fixed side nav bar on Firefox. - Fixed Flex-Layout build error. - Added Cordova mobile platform support. - Fixed Electron package script on Windows. - Added Collapse Side nav menu. - Fixed font family wrong on Safari. 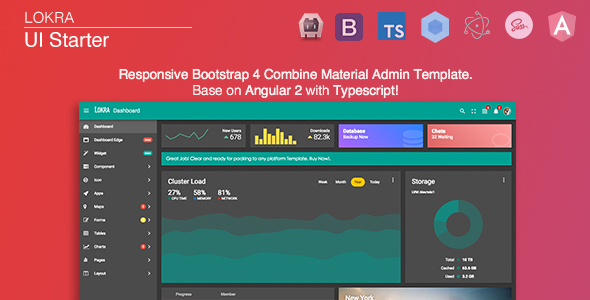 - Added Bootstrap 4 Support. - Rebuild Style Sheet for dynamic theme mode. - Added Widget Profile Card. - Fixed Dark theme style. - Fixed style bundle too large problem. - Added Theme Selector (Beta). - Reformat Code, make it clear. - Rebuild Style Sheet ready for dynamic theme. - Repack Widget Tile (More widget will be package). - Fixed global scroll bar. - Fixed calendar flex layout. - Added weather card widget.